Products: HT-2000, HT-300, PETRO-GARD® 68, PETRO-GARD® 220, OPTI-LUBE 220 and PURE-LUBE 16 OUNCE SPRAY CAN, H-1, H-2, ISO 86, ISO 100, ISO 220, and Fully Synthetic. HT-2000 is formulated from premium state of the art synthetic Polyol ester base oils and proprietary additives for conveyor roller ball bearing chains, pin/roller chains, tortilla chains, slides and gears that operate in extreme high temperature oven environments. HT-2000 has established several OEM approvals and credible testimonies from bakeries and other industries worldwide. APPLICATIONS: • Bakery Oven Chains • Roller Ball Bearing Chains on Continuous Oven Conveyors • Pin/Roller Chains on Tunnel, Lap, Tray Ovens • Beverage Can Line • Lithographic Chains & many other Industrial applications. PETRO-GARD® FG220 is acceptable as a lubricant with incidental food contact (H1) for use in and around food processing areas that meets all regulatory requirements under FDA 21 CFR 178.3570. Recommended Temperature Range: -25°C to 315°C (-25 to 600°F). 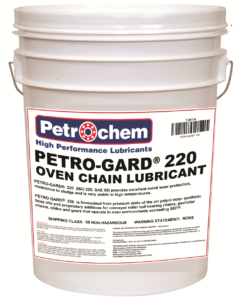 PETRO-GARD® FG-220 is a high performance lubricant formulated from premium state of the art synthetic esters and proprietary additives to withstand these extreme high temperature oven environments: BAKERY OVEN CHAINS IN: TORTILLA OVENS, PITA OVENS, TUNNEL/TRAY OVENS (PIN/ROLLER CHAINS), RACK OVENS, SPIRAL OVENS, CONTINUOUS CONVEYOR OVENS (ROLLER BALL BEARING CHAINS), BAGEL/MUFFIN OVENS, ALL FOOD PROCESSING EQUIPMENT. HT-300 is 100% Synthetic, Fully Formulated, ISO 100 (30W), Oven and Industrial Lubricant. 1988 LANHAM MACHINERY, INC., & APV/TURKINGTON & BAKETECH APPROVED. APPLICATIONS: All ingredients used in HT-300 are USDA H2 approved. • Bakery oven chains: Conventional (tunnel and tray ovens/bread and bun), Continuous roller ball bearing conveyor oven chains, ice cream cone ovens both ferris and sugar cone and corn/flour tortilla chains. • Tenter frames in textile plants; Roller chains on conveyor belts; Kiln support rollers in cement plants. • Sealed for life bearings; Drying oven chains for paint lines. • Lithographic chains for beverage can line ovens; Kiln car wheel bearings in refractory plants, and many more. PETRO-GARD® 68 is formulated from premium state of the art synthetic polyol ester base oils and proprietary additives for conveyor roller ball bearing chains, pin/roller chains, tortilla chains, slides and gears that operate in extreme high temperature oven environments. PETRO-GARD® 68 has established several OEM approvals and credible testimonies from bakeries and other industries worldwide. FEATURES & BENEFITS: • NSF H-2 registered, meets USDA 1998 H-2 guidelines – Can be used in food plants for non-food contact. Contains no carcinogens and is environmentally friendly. • Exceptional Wear Protection: It has one of the highest lubricity ratings to protect against wear, friction, rust and corrosion; thus, extending bearing, chain and equipment life. • Reduced Carbonization & Oxidation: PETRO-GARD®68 is a clean, ashless fluid-film that decreases energy consumption by maintaining optimal amperage, eliminating chain stretching and chain dragging, and many more. PETRO-GARD® 220 is formulated from premium state of the art synthetic polyol ester base oils and proprietary additives for conveyor roller ball bearing chains, pin/roller chains, tortilla chains, slides and gears that operate in extreme high temperature oven environments. PETRO-GARD® 220 has established several OEM approvals and credible testimonies from bakeries and other industries worldwide. FEATURES & BENEFITS: • NSF H-2 registered, meets USDA 1998 H-2 guidelines: Can be used in food plants for non-food contact. Contains no known carcinogens and is environmentally friendly. • Exceptional Wear Protection: It has one of the highest lubricity ratings to protect against wear, friction, rust and corrosion; thus, extending bearing, chain and equipment life. • Reduced Carbonization & Oxidation: PETRO-GARD® 220 is a clean, ashless fluid-film that decreases energy consumption by maintaining optimal amperage, eliminating chain stretching and chain dragging. • Lower Evaporation & Volatility: Very stable in high temperatures, provides longer lubrication intervals, saves money on lubricant consumption, has less smoke and no objectionable odors. • High Flash Point: PETRO-GARD® 220 has a high flash point exceeding 615°F & can be applied to either a hot or cold chain while in production, hence reducing maintenance cost and increasing productivity. OPTI-LUBE 220 is a High-Temp Performance Synthetic Oven Chain Lubricant designed for conveyor roller ball bearing chains, pin/roller chains, tortilla chains, slides and gears that operate in very high temperature oven environments. OPTI-LUBE 220 is formulated from premium state of the art synthetic polyol ester (POE) base oils and proprietary additives. NSF H-2 approved; can be used in food plants for non-food contact. Contains no carcinogens and is environmentally friendly. SPECIFICALLY FORMULATED FOR CHAIN & CASTER APPLICATIONS: Caster Races & Bearings, Conveyor Bearings, Rack Ovens, Shopping Cart Wheels, Tortilla Ovens, High & Slow Speed Chains, and Tunnel & Tray Ovens.